Unclear pathophysiology: Contemporary insight into the pathophysiology of intracranial aneurysms in general contradicts the classical concept of aneurysms being truly congenital lesions. Laboratory research (with specimens from adults) revealed an average age of collagen within aneurysms of less than 5 years, indicating a high turnover (19). Abnormality in repair processes: An alternative hypothesis is the concept of an underlying vessel wall dysfunction with transient or permanent failure to repair insults. Abluminal and luminal factors are thought to play a role (37). Iatrogenic aneurysms: Another rare form of aneurysms occurs after surgical intervention, such as brain tumor resection (15), or radiotherapy (9). In a literature review of 480 pediatric aneurysms, the author found the vascular distribution below. 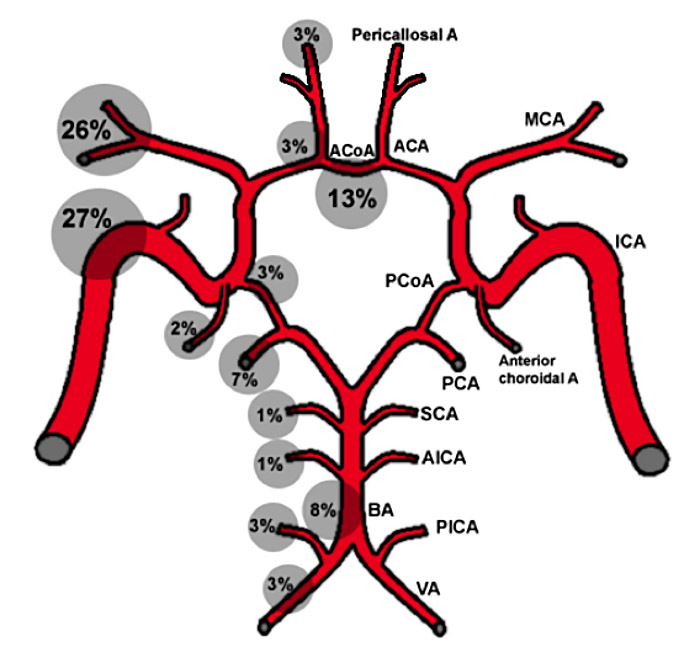 Vascular Distribution of 480 Pediatric Aneurysms: ACA=ant. cerebral art., ACoA=ant. communicating art., AICA=ant. inf. cerebellar art., BA=basilar art., ICA=int. carotid art., MCA=middle cerebral art., PCA = post. cerebral art., PCoA=post. communicating art., SCA=sup. cerebellar art., VA=vertebral art. Predisposition: Genetic conditions predisposing for intracranial aneurysms in children are mainly sickle-cell anemia, phakomatoses (e.g., tuberous sclerosis complex, NF1) and heritable connective tissue disorders (e.g., Ehlers-Danlos and Marfan syndromes) (3, 21, 28, 52, 63). Manifestation: Important implications of underlying genetic pathology are higher rates of multiple aneurysms (60% of cases) and presentation at younger age (<40 years of age), most evident for sickle-cell anemia (52, 54). Abnormality of internal elastic membrane: Absence or irregular disruption of the internal elastic membrane is the most common histopathological observation (22).